Re: Here you go, Fred. -- Joyce Post Reply Edit Forum Where am I? Thanks, Fred, it's an interesting question and, as with all interesting questions, the answer moves from simple to complicated. The simple answer is that gold does not tarnish; it doesn't undergo the chemical process that occurs when the surfaces of metals such as silver or copper or alloys like bronze interact with the surrounding air. It can develop a patina, as with your examples I would guess, but that kind of patina doesn't represent a chemical change to the metal itself. But the answer gets more complicated when we talk about gold that is not 100% pure, as most gold in antiquity was not. The first "gold" coins which seem to have come from Lydia, a kingdom in Western Anatolia in the 8th century BCE, were an alloy of about 50-55% gold with 40-45% silver and a little copper. This appears to have been an artificially controlled alloy rather than a naturally occurring electrum. Probably the main reason for the impurity was to make the gold content less costly, and secondarily to make the coinage less soft and more long lasting. Still at that point gold doesn't seem to tarnish. How much further on the impurity spectrum do we have to go before tarnishing occurs? I can't find an informed answer to that, but based on my own observation I would say we have to go well below 10 karats to somewhere around 30% gold content. 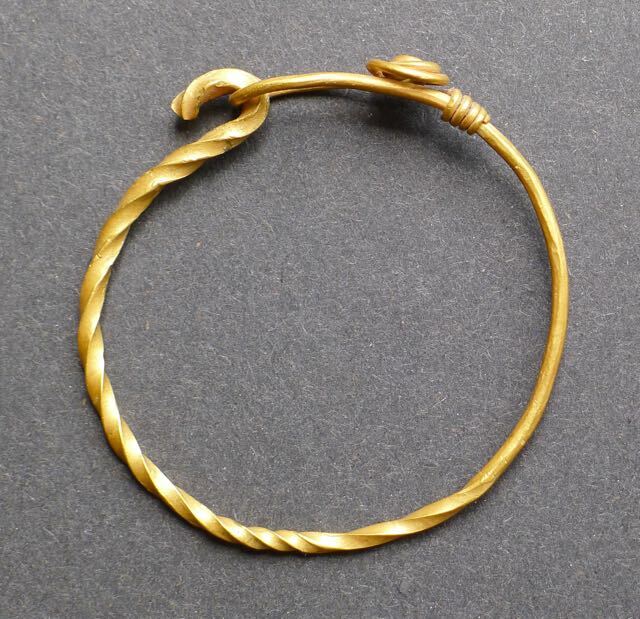 1. is a typical Roman gold bracelet, probably 2nd century CE, which is very rare because it is one of the very few examples of Roman gold found near the great port city of Oc Eo which was located on what is now the border between Vietnam and Cambodia. It had been cleaned by a friend before I bought it nearly 30 years ago, and it will never tarnish. It's more than 90% pure. 2. is a gilt image of Avalokiteshvara made in China during the Wei dynasty in the 5th century. The mercury gilding process has left such a pure coating of gold that after all these years there is no tarnishing but there is a patina, and where the gilding has worn away the bronze beneath has tarnished and corroded.